Nothing can make a banquet hall elegant faster than cloth napkins and banquet tablecloths. When tables are adorned with stately table linens, a social hall is instantly transformed. Rather than spending money to rent a large space for special events or annual dinners, you can simply reinvent the space you have and create a whole new look with table linen from Hertz Furniture. 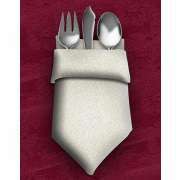 Where is the best place for table linen? 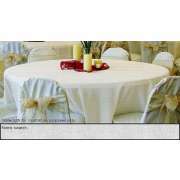 Hertz Furniture’s tasteful collection of cloth napkins and banquet tablecloths offers a huge range of sizes and styles. With such a great selection, you may even want to try a number of options. How can I dress up my folding tables? Not all tables that are sturdy and budget-friendly are attractive on their own. Although folding tables are easy to set up and take down when your church or school is hosting a special event, they might not have the look that you want in your space. To enjoy the benefits of folding tables and achieve an appealing arrangement at the same time, you can adorn your temporary furniture with elegant cloth napkins and tablecloths. When the surface of the table is elegant and inviting, nobody will notice what it looks like underneath all of the fabric. Table linens don’t just hide the surfaces they are covering, they can liven up a whole room, transforming a drab gym into a dance club or formal reception hall. With the right choice of colors and materials, nobody will recognize the room when you are through. How do you choose table linens? The first factor you want to consider when selecting napkins and wedding tablecloths is color. You want to make sure that the linens you choose will match with the decor of the room they will be in. If the space you have is relatively plain, multiple colors might be worth considering. 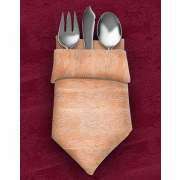 With a flexible budget, it might be fun to order a number of napkin and tablecloth sets to vary the decor for different occasions. With new colors coming into the banquet hall, you can easily coordinate themed events. You may choose cloth napkins in tones that reflect certain holidays or seasons, or pick up colors from the floor or wallpaper. We have an unbelievable variety of colors, so you are sure to find the table linen you are looking for among our selection. What is the best material for banquet table linens? Material is a big consideration when ordering table linen. We have woven polyester, dark spun polyester, light spun polyester, lace, damask and tuxedo stripe. Dark and light spun polyester combine the softness of cotton with the strength of polyester for a winning combination. Lace is appropriate for occasions such as weddings and religious ceremonies. Damask feels like cotton but has a rich and luxurious look. Tuxedo stripe adds a bit of extra detail while maintaining a stately appearance. What size event tablecloths do I need? Make sure that the items you ultimately order will fit your furniture. Whether you have round or rectangular banquet tables, you will get a custom fit so there won’t be any fabric dragging on the floor or corners peeking out. All of our table cloths and cloth napkins are made-to-order so you can create a personal arrangement that fits a number of sizes perfectly. Overwhelmed by the prospect of keeping fancy fabrics clean? Concerned about the shelf life of your wedding table linens? Our machine-washable napkins and tablecloths can easily will be cleaned, and will come out looking like new time and time again. They are stain-resistant and can be tumble dried, so they are cleaned up and ready to be used again in a flash. Even if you have two events in a row with only a few hours in between, you can still arrange a fresh-looking room for each celebration. Banquet table covers and cloth napkins also save money in the long run. While temporary tablecloths might seem easier to deal with, they are less classy and the expense of buying new ones for each event will add up quickly. 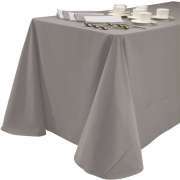 When you have a stock of linens that is always available, you will never have to scramble at the last minute to make sure that you have a proper way to cover tables for the teacher appreciation dinner or athletic department awards dinner. 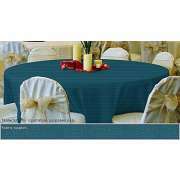 Because banquet tablecloths are used over and over, they are also an eco-friendly purchase. 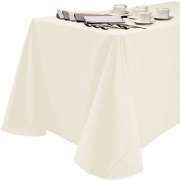 Elegant cloth napkins and tablecloths from Hertz Furniture will give a drab space a whole new look. With abundant choices of stately materials and colors, you are sure to find great options to coordinate with any space or theme. To ensure that you order the right quantities and dimensions, contact the Hertz Design Center for free project-planning advice.